Even if you’d eaten a meal at Tacoffee every day since it opened on January 30, you’d still only be 5 percent of your way through their menu. The new restaurant and bakery, located on the corner of Grand and Lorimer in Williamsburg, has no less than 234 items on offer, from American to Tex-Mex to authentic Mexican fare. We definitely did a double take earlier this year when Cafe Figaro became La Esquina Burrito & Bar. The logo of the new Mexican joint on the corner of 10th Street and First Avenue had a red-and-green color scheme similar to that of La Esquina, the perennial Nolita hotspot. Has Carrera’s Taqueria Served Its Last Super Taco? 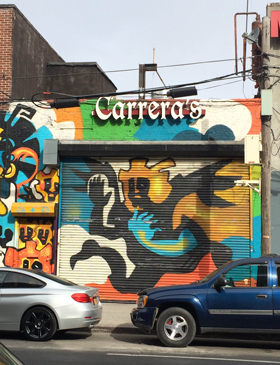 Cheap-eats lovers, get ready to cry into your napkins: Carrera’s, a small Mexican restaurant located off the Morgan L in Bushwick, may be taking a dirt siesta. The consistently affordable prices at Carrera’s were a welcome comfort in the midst of a neighborhood that seems to be getting pricier by the day. Chips and salsa were free, chips and guac were $5, and their generously portioned entrees typically ran in the $7 to $11 range. If you’re among those who feel like the East Village is looking more and more like Murray Hill, you’ll get a kick out of this one. Blockheads, the Cal-Mex chain that launched on Third Avenue and 34th Street back in 1992, is opening its East Village location in a couple of weeks. The East Village and Lower East Side have an abundance of nouveau Mexican restaurants. Some of them, like Empellón Cocina, are hits that spawn knockoffs like Empellon Al Pastor, and others not so much. Still, people keep opening these places. After attending a bug banquet in the East Village, we were determined to preach the gospel of insect eating. So we stopped by Toloache in the South Village to get some grasshoppers, put them on toothpicks, and offered them to total strangers. Watch the video to see who jumped at the opportunity and who bugged out. The first sign that the new El Sombrero isn’t the Mexican dive that stood on the corner of Ludlow and Stanton for nearly three decades is the neon fedora. Two takeout spots born in the East Village are heading west this month — the first, ChikaLicious, will open on Bedford Street this week. As promised in August, Oaxaca — the taqueria that started off on Smith Street and now has half a dozen locations in the East Village and elsewhere — has expanded into Williamsburg with a location at the corner of Grand and Berry. Man are the husband-and-wife team behind Chelsea’s Cookshop keeping busy. Last week Vicki Freeman and Marc Meyer debuted Vic’s in the space that previously held their Noho brunch spot Five Points. And now, with this sign, they’ve announced to the denizens of Second Avenue that they’re getting ready to open Rosie’s in the former home of Boukies.